Good article. They just keep trying to chip away at the wrong side of the issue. ~ IL CCL 75 days from application to in hand! ~ I'm not the "bad guy" here, I just want to be able to defend myself and my family. Anywhere I should be permitted to carry a pencil (1st amendment), I should also be able to carry a firearm (2nd amendment) !!!!!!!!!! "Why do I carry a handgun? Well, look at it this way -- I keep a fire extinguisher in my house. I don't expect to have a fire; indeed, it's highly unlikely. But in the unlikely event of fire, not having the means to stop the fire could result in serious property loss or personal injury to myself and my family. Neither do I expect to be a victim of violent crime; indeed, it's highly unlikely. But in the unlikely event of a violent crime, not having the means to stop the criminal could lead to serious property loss or personal injury to myself and my family. It is simply a matter of common-sense prudence." Drawing any line only restricts law abiding people from crossing such a line. The "line" doesn't exist for criminals so we have to support the second amendment. "The only thing that will stop a bad guy with a gun, is a good man with a gun"
My deep rooted hatred for socialism (entitlement?) comes from reading her books at a young age. I suspect my libertarian leanings started there as well. “My dear fellow, who will let you?" What they expect people to do when they pass illegal laws retroactively and are corrupt and committing treason and are paid by billionaires to push their agenda to make legally bought firearms illegal. They have broken their oath to defend the Constitution and have become domestic enemies of the Constitution and people see right through their agenda and know what has happened throughout history after firearms were taken away. Edited by 357, 19 January 2019 - 12:34 PM. Edited by 45Badger, 19 January 2019 - 04:41 PM. .45 ACP - Because Shooting Twice Is Silly! A lot of gun owners are asleep and can't see the real conspiracy to deprive them of their rights. A lot more are apathetic and will regret not doing more. Throughout history freedoms have been taken away under the guise of safety. Keep up the good work Steve. Thank you. And I will. And I do offer anything I can assist with to the mods/lobbyists here. heck, a certain org here had me speak at two events and it was a success. This is the new way to fight (alongside the classic way). Adapt! What is written on the Internet stays on the internet forever. I would never admit in writing that I plan to violate any law. Everyone knows that but people are being pushed not to care anymore and that is civil disobedience against unconstitutional laws passed with bribes to push the agenda of billionaires. Democrats took the genie out of the bottle two years and openly defy and violate laws they don't like and our Constitutional rights and and force the police not to enforce those laws and they openly defy and threaten the president all over the internet and have created a resistance movement against president Trump and nothing is being done about it. We have a 2nd amendment right and a right to free speech which those countries don't have and both rights are under attack by the same people. It's time to speak out and resist as the democrats say. I think an American version of a “yellow vest” is typically OD green and capable of holding 10”x13”x1” personal protection objects in front and back. Looks like there's going to be a lot of defying going on in Illinois now that the grabbers have started down the AWB road. How do they estimate the percentages? I wonder how many AR's and AK's are floating around Illinois? Both legal and illegal? A law that doesn't exist yet? If we live in a country where prosecutors can get a search warrant by showing a judge an internet posting about a law that didn't exist when the post was made, I think it'll be time for a revolution. What gets me is how stupid people are concerning these forced "registrations". That I can see, they only have one purpose, future confiscation. Perhaps anyone here could give me another rational reason for such an act, but I cannot see one. They want to know exactly what you have so they can take it from you at will...I see no other purpose. ...that's why the claim of "no one wants to take your guns away" irritates me so much...yes, yes they do, 100%. Edited by steveTA1983, 28 January 2019 - 11:10 AM. 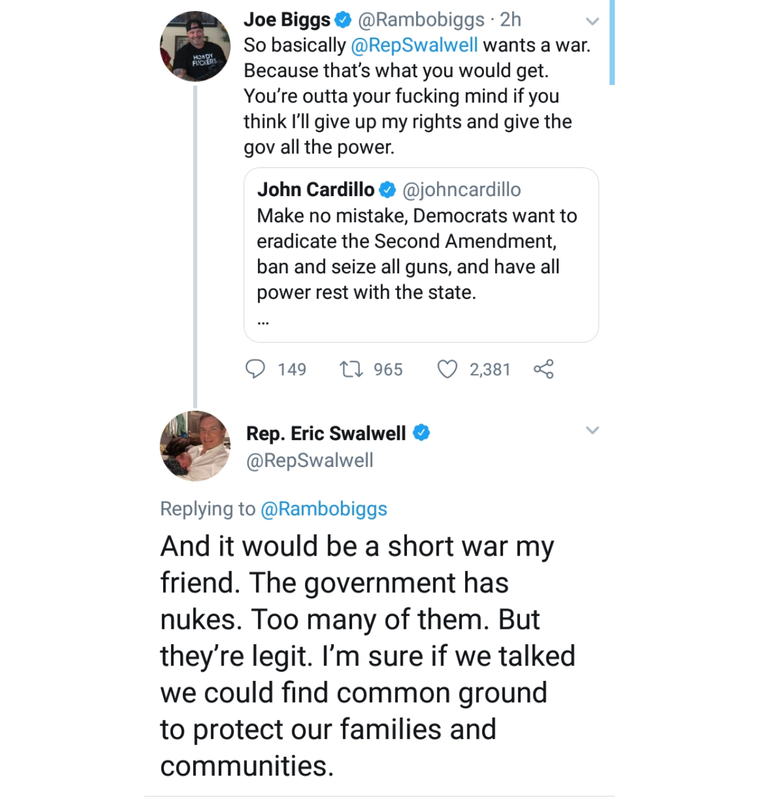 First of all Rep. Eric Swalwell must have something seriously wrong with him to make such an idiotic statement. A politician threatening American citizens he supposedly represents with nuclear attack even in jest is beyond stupid. The second thing is, and I just can't figure it out no matter how hard I try....why on Earth do Democrats / liberals try so hard to have THEIR own rights stripped and have the gov't. run their lives from cradle to grave ? Just had a thought - it happens every now and then. Technically UnConstitutional laws are null and void and don’t need to be followed. States Attorney / prosecutors know this. Thought that came to mind is that why do you think people without a FOID or CCL who used a firearm in a legitimate self defense scenario aren’t charged or prosecuted? Why do you think we haven’t heard about people being charged / prosecuted for bringing firearms on public transportation, or having 15+ round magazines in Chicago or Cook County??? It’s been 5 years. No “test” cases yet? Come on !! They (legislators/prosecutors) KNOW the laws are Unconstitutional!!! I’m beginning to think “they” know that the Anti 2A laws are bogus !! And IF they tried to prosecute, that upon challenge - they WILL lose !! How about those states / towns that passed those bogus registration and “assault” weapons bans?? It’s been years on the books in some cases. Anyone arrested? Successfully prosecuted?? Are we really in the Matrix?? Red Pill vs Blue Pill. OR,are these Anti 2A legislators passing these UnConstitutional laws knowing that most of the people will just follow like sheep ?? I'm a professional troubleshooter. I fix things that worked yesterday that don't work today and I teach others how to solve problems and troubleshoot effectively. The first thing I teach people who want to solve a problem is to objectively find the root cause of the problem. Doesn't matter what you think it is. You can't feel or guess yer way to a solution. You must correctly identify the root cause and resolve it. And no one has correctly identified the root causes of our failures to stop mass killings in schools, etc. It's not the fact that people want me disarmed that upsets me it's *WHY* they want to disarm me....every living thing has a right to defend it's Life using the best weapons it can deploy. The only reason to disarm a free human is to force him, enslave him, or control him by killing him or his family. People know this. So they want to make us gun owners criminals any way they can by inventing laws they know we will break so they can arrest us, disarm us, and force us to comply because we are defenseless. It's not the fact that they want me disarmed. It's why they want me disarmed and what they plan to do to me once that happens. Once we are disarmed and made to be criminals they can force us to do anything. This is why they want to do this - so they can kill us. Another thing that frustrates me about the proposed Illinois law and "non compliance" is that non compliance is a felony with proposed jail time and serious fines. This raises the risk (to me) to an unacceptable level. I have lived in Illinois for essentially 99% of my adult life, paid my taxes, and lived as a law abiding person. I don't even speed, talk on the phone while driving, or break any laws. I take great care to observe the letter of the law in Illinois. And if this passes I'm supposed to make myself a criminal by non compliance. I don't think I can do that. Go to jail over a protest I can/will do but making myself a felon by non compliance is not something I can make register in my brain. There is always option 3. Rent a small (5' x 5') storage locker in a nearby state, put a gun safe in it and store your banned guns there. As much as our overlords and the ISP wish they have no say about what we have outside Illinois. This way you don't become a felon and get to keep your stuff. Then all you need is to find a range close to where you store your stuff to go shooting. We are already set to move out of state. This passes all my non-compliant firearms will be moved out of state until we can move. This state is on its way to total meltdown. Financial crisis is imminent.